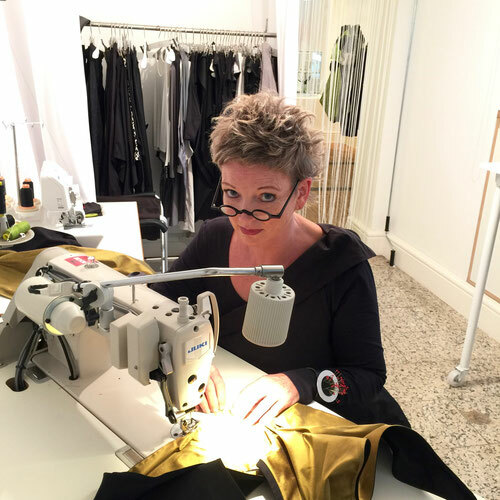 Since 2008 Sabine Wagner has been designing and producing timeless fashion in her studio in Worpswede with a very unique style and an exceptionally clear line. The rural ambience of the Devil's Moor in the artist town of Worpswede inspires her and gives her peace and creative power away from the hustle and bustle of the city. Their demands on the quality of the materials used, as well as on the workmanship, allow their creations to blossom into wearable works of art with a down-to-earth substance. Sabine Wagner's scarves, versatile combinable outfits and accessories give the wearer a special feeling of individuality and give her lasting pleasure. "Dresses for women who dare"
"Sabine's aim is to express a woman's femininity with her designs and to give a feeling of individuality in this fast moving world. 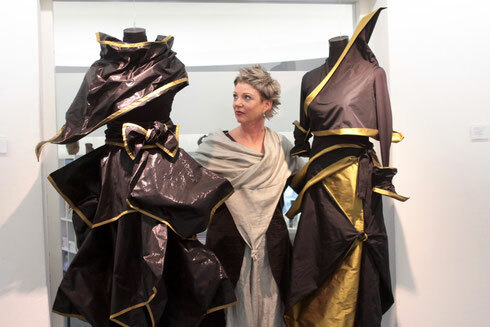 She attaches great importance to structural clarity, the beauty of the material and wearability in choice of fabrics. She designs interchangeable pieces contrasting deep black, easy-care microfiber with the colorful brilliance of shimmering silk. Every item fits easily into your suitcase and guarantees the perfect look, whether for business or pleasure."